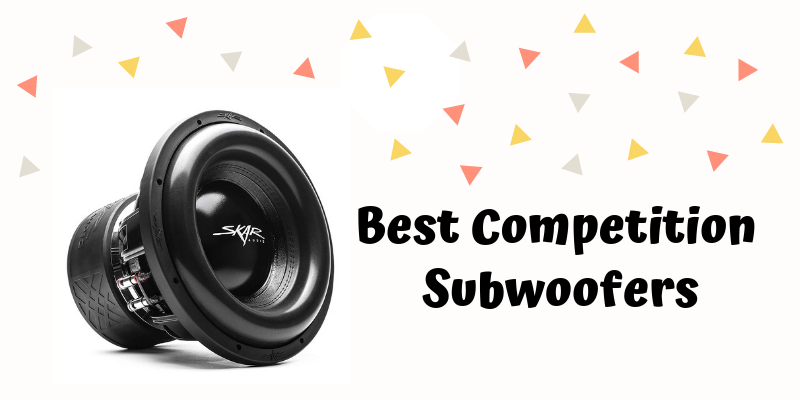 Competition subwoofers are definitely one of your best ways to impress people with your sound system. Their combination of raw power, high impact, and quality specs outweigh other upgrade options for those that want to be heard a long time before they are seen. Yet, as is usually the case, the choice available has an incredible amount of variation, both in terms of quality and inability. So what should you buy? Don’t worry, we’ve done the work for you. This review will cover eight of the best competition loudspeakers you can buy today. We’ll be listing the pros and cons of each one and finding out which, in our opinion, is the best over-all. We’ll start at the top with the most expensive speaker we’ll be reviewing – the JL Audio 12W7AE. But, price usually relates to quality, and that’s the case with these speakers. They are built for those who love their music and are willing to pay more, to hear it in the best possible way. Every 12” 3 ohm W7 series Subwoofer is hand-built and features a plateau-reinforced spider attachment and radically cross-drilled pole piece. 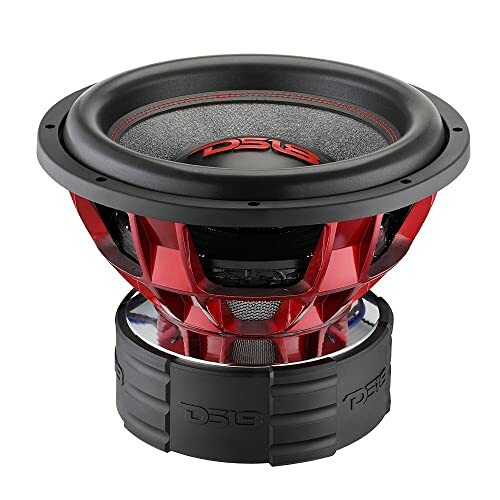 The solid cast-alloy basket and polypropylene W-Cone with polyester foam surround help reduce movement which could affect the clarity of the bass frequencies. You can power them between 400 and 1,000 watts RMS, with a peak power handling of 2,000 watts. The frequency response goes down to a very respectable 18 Hz, with a high at 200 Hz. If you’re looking for the best, and are happy to pay for the pleasure, then the JL Audio 12W7AE could well be the perfect speakers for you. Sound fantastic at lower wattage but due to their lower power rating, not as good when pushed harder. 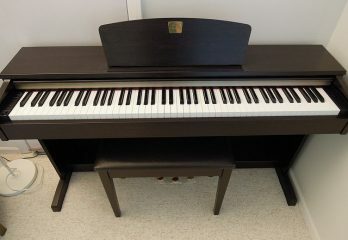 There are other cheaper options which sound nearly as good for a lot less money. The HCCA152 is one of the most expensive subs offered by one of the industry leaders, Orion. But it’s still quite a bit cheaper than the JL audio, and also remember this is a 15”, whereas the JL was a 12”. It features a new high-quality voice coil for higher power. And, with a peak power handling of 5,000 watts and 2,000 watts RMS, this certainly does the job. But this does have a downside, the size and power mean that you will need some serious cooling. It does come with its own enhanced voice coil cooling systems and temperature control which should take care of the speaker, but the amplifiers needed to power it effectively will most definitely get a little hot around the edges. Regarding its specifications it features a polypropylene cone woofer with a rubber, tri-radius, symmetrical surround and dual flat conex spiders with loop stitched tinsel leads. You’re going to need some box space to house these as well, a pair of them can easily fill up an average sized trunk. Plus with all this power, you’ll need some extra batteries as well. They are incredibly loud! And, by loud, we really mean LOUD! They also hit really hard. The sound pressure alone feels like your swimming in 15-20 feet of water. If loudness is your thing and your willing to work to get the battery power to keep your system running, as well as cool enough to function efficiently, then these are an excellent choice. Many buyers report reliability problems. 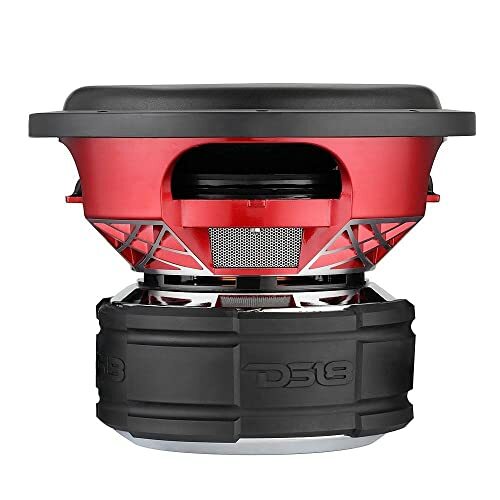 Going back up in price and in wattage, we find this great 12” competition grade subwoofer from DS18 – the HOOL 12.2D Hooligan. It’s no compromise design, has been created for fanatics and audiophiles, so this speaker isn’t only about volume, it’s also about quality audio at earth-shattering volume, if that’s possible? So let’s discuss the volume, well, it’s best described as phenomenal. With a peak power handling of 6,000 watts and RMS power of 4,000 watts. Now, that’s a lot of power! Regarding its specifications, it’s made from the highest quality composites available. 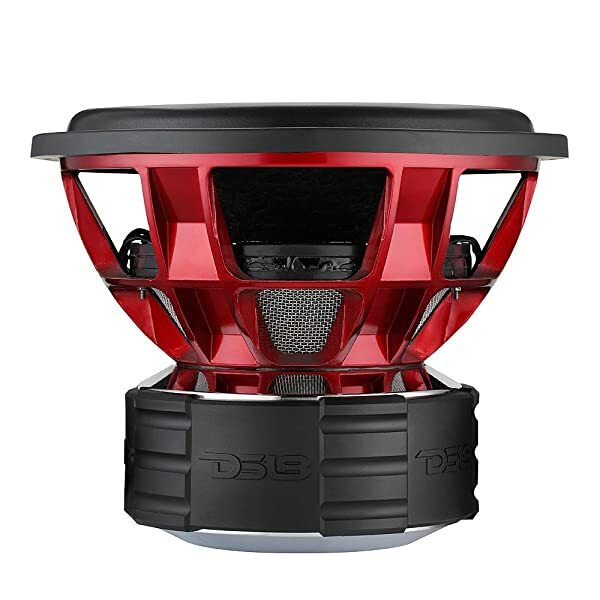 With three 114 oz high strength magnets, 4″ black aluminum four-layer voice coils, and a six-layer convex spider. It’s available with a two-ohms impedance. We’ll end by quoting a warning that is given by the manufacturers which states “Warning: you might piss off all law enforcement entities nearby.” If that doesn’t say it all, what does? None except that your neighbors will seriously not like you when you start pumping the tunes. From the three of the most expensive best competition loudspeakers, we now go to something a lot more affordable – the Skar Audio ZVX-12v2. 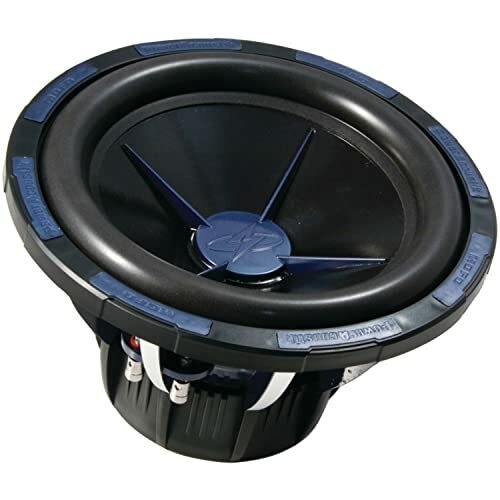 This 12” subwoofer is unrivaled in performance and reliability within its price range and has a max power rating of 3,000 watts with an RMS power rating of 1,500 watts. 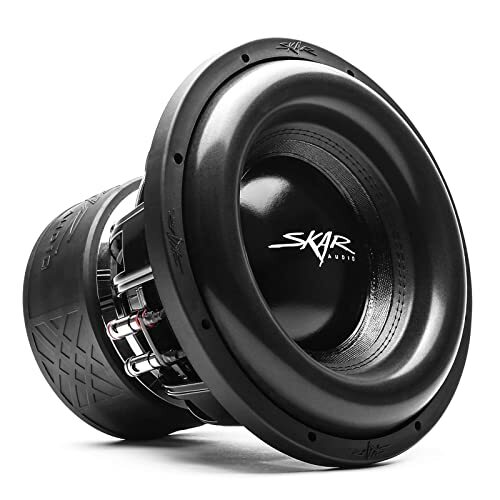 This makes it the ultimate 12-inch SPL grade woofer Skar Audio has to offer. The driver was engineered to perform efficiently and withstand brutality at the high levels of output power. This makes it an extremely reliable and powerful subwoofer. It utilizes a three-inch, high temperature, eight-layer copper voice coil that is made in the U.S.A. and a massive 306 oz triple slug magnet. When these are combined with the high roll foam surround and its competition grade paper cone, it performs superbly. It also features an advanced airflow cooling design. It has a frequency response from 30 Hz to 400 Hz, which is low, but not as low as the more expensive subwoofers we’ve just looked at. Less expensive than many speakers featured. Excellent build quality and sound for the price. Sound great at lower volumes, but not so good when pushed hard. Here’s our second loudspeaker from DS18, and it’s bigger than the first at 15”. Even though bigger in size, it actually puts out less power, rated at peak power handling of 4,500 watts with an RMS power of 2,500 watts. It’s again created for fanatics and audiophiles, and also features the same high-quality composites as it’s smaller brother, but features three larger 150 oz high strength magnets to allow for the increased speaker size. The black aluminum dual voice coils are identical on both speakers. The speakers sound incredible and have a highly engineered stylish look with wonderful red accents. If any speaker deserves to be seen from all angles, it’s these beauties from DS18. 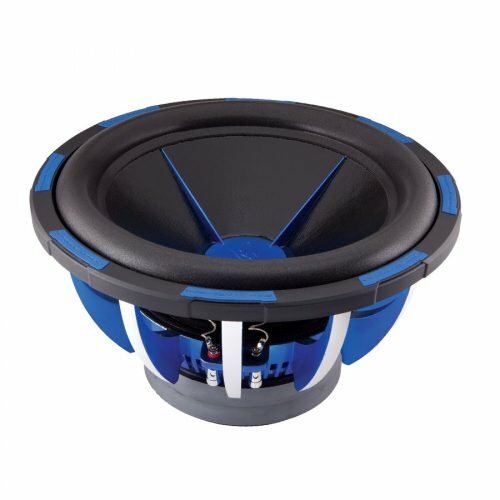 These 15″ Competition Grade subwoofers are available with either 2-Ohms or 4-Ohms Dual Voice Coils Configurations. And are a great buy for anyone who has the space to install their bigger frame. We’ll move on with another very affordable speaker – the Power Acoustik MOFO 12”. It’s a fantastic looking speaker for the low price, with its beautiful royal blue finish with diamond cut accents. It will look great wherever you install it, but remember to use plenty of perspex to let others enjoy the color combo. Volume wise it kicks out a peak power handling of 2700 watts, with RMS power of 1350 watts. So, it’s a lot lower powered than the monsters we covered earlier in this review, but that is understandable considering it’s a lot cheaper as well. We have to be honest and also state it doesn’t sound as good either, but it wouldn’t, fair play. For the cost, it’s a great sounding speaker, and if you’re on a budget, it’s a great choice. It has received a lot of praise online from buyers, who think that it delivers excellent sound quality for their volume needs. 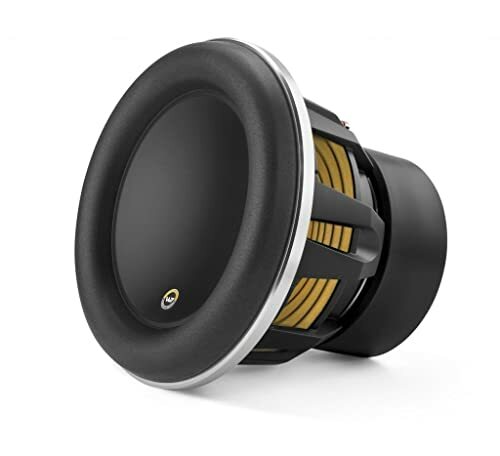 Regarding its specifications, its a 12” competition woofer with aluminum dust caps fins which help dissipate heat. The cone is made from a cloth paper composite, with a 4-spline heatsink, dual conex spiders and a UV coated surround. Don’t be put off by the price, it’s a great sub. It can’t compete with those costing 4 times more than it, but how could it? If you’re on a budget, it’s a great buy. Sounds good for the price. It is praised online as mentioned, but it also has a lot of haters. I think the main reason is that they expect it to sound very close to the more expensive models. I simply doesn’t, but it does sound good for the price. That needs to be remembered when judging it. And if you thought the Power Acoustik MOFO 12” was cheap, you better sit down and take a stiff drink. Next up we have the most affordable subwoofer in our review the Kicker 10C104. It’s a 10” speaker not a 12” like the Power Acoustik MOFO so you would expect it to be cheaper, and it is by about a third. But for that price, you don’t get a Kicker 10C104, you get a pair of them! Yes, two speakers for about 66% of the price of the MOFO. Now, that’s cheap. So, what do they sound like? Well, not great to be honest, but completely usable in most cases if money is tight. The clarity and punch of the bass can’t be compared with for example the DS18’s, but for the money, they are really good. If your thinking of doing your first install and don’t want to spend a fortune on it, they are a great stepping stone into competition audio. If with time you want to upgrade your system, as everyone does, swop them out then. You really can’t go wrong with these Kicker subs. It’s also the lowest wattage speaker in this review, pumping out only 500 watts. But the specs aren’t bad, featuring a flex-killing, super-rigid, injection-molded cone with 360-degree back bracing, high-temp coil wire, and a vented pole piece for heat dissipation. The basket is steel with coil-cooling perimeter venting and a ribbed surround for strength when pushed hard. It also features the proven Spiralead tinsel-lead technology for ultimate durability. Being smaller in size also gives you more install options, the Kicker 10C104 will perform in vented or sealed enclosures, as well as, in free-air applications. 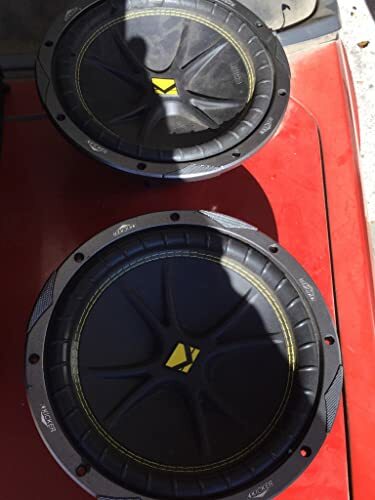 The Kicker 10C104 is a great upgrade option for those on a budget or with smaller cars. Sounds good for the low, low price. Due to its 10” size, many users have complained that it sounds more like a regular speaker than a ‘true’ subwoofer. And finally, we have the bigger brother of the Power Acoustik MOFO 12” we just reviewed – the Power Acoustik MOFO 152X. Which is basically the 15” version of the same speaker. 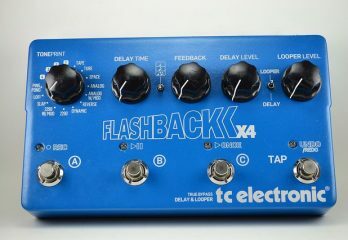 It looks and sounds like it’s brother, but the bigger size allows it to go down lower into the bass frequency range. 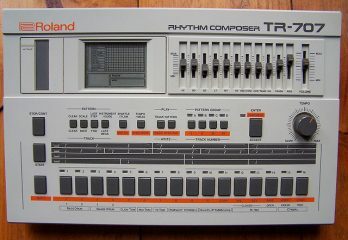 Therefore, if you want super low end and have room for it’s bigger bulk, it’s a great option over it’s 12” brother. It’s a little higher in output than it’s sibling, with a peak power handling of 3000 watts, with 1,400 watts of RMS power. The specifications are also similar, coming with the Power Acoustik Nb1 1″ tweeters and a niobium rare earth ferroelectric transducer magnet. Color-wise, it’s the same blue cast aluminum basket with diamond cut accents and a chrome backplate. It also features a cloth/paper composite cone, a UV coated foam surround and a one-piece rubber gasket with color-matched inserts. 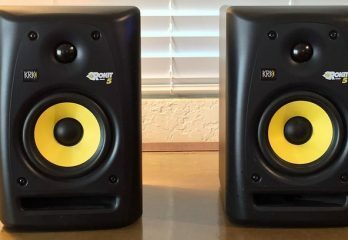 So, if you can handle the bigger size and want more bass, the Power Acoustik MOFO 152X is a great subwoofer for the price. 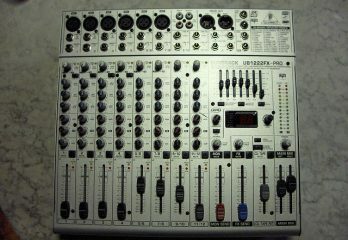 Many buyers have reported that they are very happy with the sound quality, but not so satisfied with the build quality. 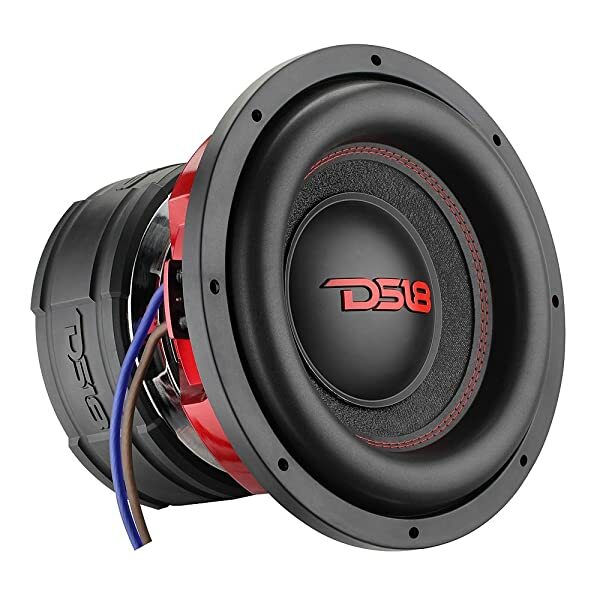 Let’s finish up by covering the basic types of competition subwoofers available and what you should consider with each. The first consideration is more than likely going to be volume. If you are used to listening to regular speakers, then the amount of bass on competition subs is probably going to surprise you. Volume does have its downside though, the more volume you want, the more you will need to spend, not only on upgraded speakers but also on more powerful amplifiers, additional batteries, cooling systems, etc. 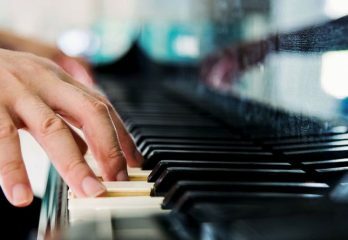 The second consideration you’ll probably want to focus on is bass. A great low-end will enable people to not only hear your subwoofers but also feel them. The more powerful the bass, the stronger the low-end will carry, and the more impact your speakers will have on those around them. But. 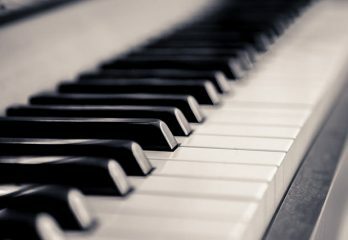 all that bass does have a problem, in that it can cause the sound to become muffled if you don’t match your speakers, crossover, and amplifiers correctly. We all love the way things look, our cars, our clothes, even our partners. So, we obviously also need to love the way our competition loudspeakers look as well. They need to look fantastic and stand out from the crowd. DS18 has got the looks department down to a fine art, all other manufacturers could learn a thing or two from their styling. Heavyweights, as its name suggests, are heavy. They are designed to have it all. A perfect mix of volume, bass, and looks. When the magic formula is correct, you’re sure to be a competition winner. However, there is a downside, in that they are the most complicated setups to get right. In order to get heavyweights working to their full capacity, they will need some serious power. This results in you needing a bigger power source and a way of keeping it cool. They also overheat if not installed correctly, and that might cause further damage to the rest of your install. All that said, if you do get it right, there is nothing that sounds, looks or feels like a heavyweight! DS18 and Orion specialize in Heavyweight speakers. Before you think that a lightweight is a bad option, it isn’t. It’s just another way of achieving a great result. It does hold its own when compared with the other types available. But in a different way. As opposed to being all ‘heavyweight,’ it aims to provide a quality, reliable and powerful sound system in a lightweight and inexpensive package. You won’t get the superiority of the heavyweight, but you will end up with a great sounding system for a lot less money and stress. Kicker is a great brand at producing products for the lightweight category. So, What Are The Best Competition Loudspeakers For You? We’ve gathered together the eight best competition loudspeakers currently on the market. They are all excellent choices and which one is best for you, will mainly depend on your budget more than anything else. Regarding volume and features, as you may have noticed, they are all quite similar. They are, after all, all speakers. But, what sets them apart is the build quality, the looks and how they sound. 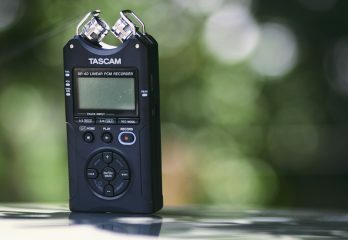 The more expensive models reviewed sound and look better than the cheaper ones and therefore, understandably have a higher price. It won because it offers the best over-all features for the price. It’s near the top of the price bracket, but we think it is more than worth it. We absolutely loved its sound, nothing apart from it’s smaller brother the DS18 HOOL 12.2D Hooligan came close to it. It beat it’s sibling to the title because of it’s improved low-end, and it’s even better looks. But if you don’t have enough room to handle a 15” the DS18 HELLION-15.4D, then the DS18 HOOL 12.2D Hooligan is an excellent choice. We also loved the color and the eye-catching design. Looks are so important in competitions, and nothing else comes close to the look of either of the DS18’s we’ve reviewed. Honorable mentions also go to the Kicker 10C104 for fantastic value for money. Have fun choosing the best competition loudspeakers and make sure that your choice literally blows the competition away!